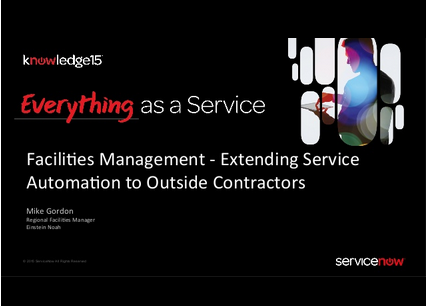 Facilities management is a big part of the broader approach to Service Automation. More and more, facilities management software is no longer operating in isolation from the rest of an organization’s systems, especially those related to supporting other corporate services, from IT requests to HR processes. Recently, ServiceChannel client Mike Gordon, Construction & Facilities Manager, Einstein Noah Restaurant Group presented (at the Knowledge15 Conference) how his firm takes a more holistic view of automating all their services with both ServiceChannel FM software and ServiceNow applications in a combined approach. In his presentation, Mike detailed how ServiceChannel’s used for facilities management service automation in conjunction with ServiceNow being used for Enterprise/IT service automation – across Einstein Noah’s 850+ locations. The key takeaway for them: They use service automation everywhere – for both inside and outside services and resources. This has only become possible with data and analytics which crucually, is enabling its move from being a reactive to a proactive organization.